Considered by many specialists to be the most advanced antioxidant formulation in the world, Life Extension Mix™ has been reformulated 18 times since 1983 to reflect new scientific advances. What distinguishes Life Extension Mix™ from rival products is the pharmaceutical grade and optimal amounts of each nutrient used, as well as the inclusion of cutting-edge' nutrients such as D-glucarate, luteolin, punicalagins and hydroxytyrosol. - Life Extension Mix™ contains 94 unique vegetable, fruit and plant extracts, as well as potent amino acids, vitamins and minerals, and special antioxidants. Botanical extracts are added to help maintain healthy cells via physiological processes separate from those of traditional antioxidants. - The concentrated extract of broccoli sprouts in Life Extension Mix™ provides standardised levels of sulforaphane and D-glucarate which protect cell DNA and prevent the formation of tumours via detoxification and anti-mutagenic mechanisms. - D-glucarate supports detoxification via glucuronidation mechanisms, helping to eliminate toxins from DNA. - Olive polyphenols help prevent LDL oxidation, quench free radicals and stabilise cell membranes. Life Extension Mix™ contains a powerful olive extract standardised to provide 7 % hydroxytyrosol, a well-researched polyphenol. - Cocoa polyphenols support endothelial function by maintaining healthy levels of nitric acid and neutralise dangerous inflammatory factors, thus reducing cardiovascular risks. - The flavonoid luteolin is able to protect DNA from oxidative damage. It can also suppress excess levels of harmful inflammatory cytokines, such as interleukin-6 or interleukin 1B. It protects cells from cancer via a number of mechanisms. - The green tea extract in Life Extension Mix is the most powerful such extract currently available. It has the highest levels of EGCG (epigallocatechin gallate), the component scientists believe is responsible for the health benefits of green tea. - Punicalagins from pomegranates are the new antioxidant stars', with the latest research showing them to be extremely biologically active and bio-absorbable. - Sesame lignans increase tissue levels of vitamin E and gamma-tocopherol. They inibit formation of the inflammatory precursor, arachidonic acid. - High intake of lutein and zeaxanthin is associated with low rates of age-related macular degeneration. Lutein also reduces risk of certain forms of cancer. The carotenoid lycopene is linked with protection against prostate and pancreatic cancer. It also prevents oxidation of LDL-cholesterol. - Berry and fruit extracts, such as blueberry, grapeseed, grapeskin, and bioflavonoids from citrus fruits combine to maintain healthy circulation and protect DNA. - High levels of vitamin D3 (2 000 IU) are included to help maintain optimal bone density, protect DNA and reflect scientific opinion that current average intake is insufficient for health protection. - Life Extension Mix™ contains only the natural form of vitamin E which is more effective than other forms at promoting healthy DNA and protecting against cancer. - Life Extension Mix™ provides the active enzymatic forms of vitamins B2, B5 and B6, as well as active amounts of all the B group vitamins. - Pyridoxal 5-phosphate helps to protect against glycation reactions. - Life Extension Mix™ contains a superior and biologically active trivalent chromium complex, a unique, dietary, water-soluble form of chromium. Research shows that, compared with a placebo, it reduces blood sugar levels by 33 %. Chromium, magnesium and biotin are all essential nutrients for maintaining healthy blood sugar levels. - Magnesium helps protect the arteries, heart valves and neurons from excess calcium. Life Extension Mix™ provides high levels of magnesium in six different forms to adequately saturate substrates. - Zinc is often poorly-absorbed. 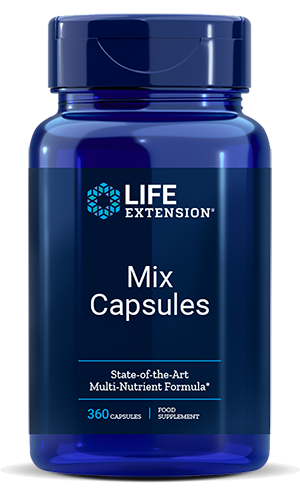 Life Extension Mix™ provides it in its two most bioavailable forms. - Boron is essential for maintaining bone density and also helps promote health development of prostate cells. - N-acetyl-cysteine provides intracellular antioxidant protection, supports immune function and has antiviral properties. Taurine provides extracellular protection and protects the eyes from peroxidation and glycation. - Maintaining adequate levels of acetylcholine in the brain helps prevent age-related mental decline. Life Extension Mix™ provides modest amounts of cholinergic precursors. - Secondary antioxidants can stop existing free radical pathologies. Life Extension Mix™ contains the two best-documented secondary antioxidants. Other ingredients: rice flour, gelatin, maltodextrin, silicon dioxide, microcrystalline cellulose, dicalcium phosphate, stearic acid, magnesium stearate, sodium croscarmellose. Take 14 capsules per day: 5 with breakfast, 4 with lunch and 5 with dinner. Warning: Life Extension Mix™ contains niacin. Increase the dose progressively over three or four weeks. Contains: soy beans, corn, sesame, fish, yeast.